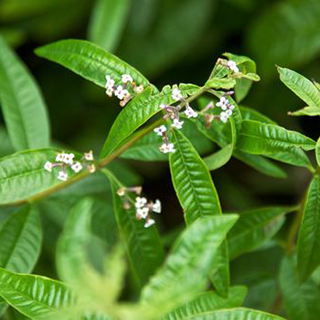 Originally found growing in rocky areas of Chile and Argentina, lemon verbena is now cultivated worldwide both as a highly aromatic garden ornamental and for use in perfumery. It is also used in potpourri or in cooking to give a strong lemony taste to desserts, marinades, and fruit drinks. It is traditionally regarded as both soothing and uplifting, so is used in restorative teas. Use 1/2 tsp dried leaves per cup after meals for flatulence or at night for insomnia. Combine with dandelion leaves and drink 3 times daily to improve liver function. Can be used to ease feverish conditions in children; consult a herbalist for advice on dosage. Add 1 cup of above infusion to bathwater to ease stress and tension. True lemon verbena oil is difficult to obtain, as it is often adulterated with other lemon-scented oils. Use 5 drops in 1 tbsp (15ml) of almond oil as a massage for cramps, indigestion, anxiety, insomnia, or other stress-related conditions. Prefers full sun and moist but well-drained soil. Usually propagated by heeled softwood cuttings in summer; it also self-seeds if it sets fruit after a hot summer. It is not frost-hardy, so in colder areas is best grown in containers and over-wintered under glass. Alternatively, cut back to the wood, keep dry, and protect with fleece or straw lagging in winter (it should survive temperatures as low as 5F/-15C). Collect the leaves in summer.